This isn’t the same as saying no to a discount – although that is equally important. From time to time you will encounter a case that is going to cost you far more than you can bill for it. 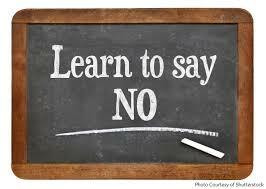 Even if work is hard to come by, learn to recognise problem cases early on, and then learn how to say “no thanks” in a way that won’t offend your (future) client!